It feels so good to play more Hitman. I am a machine. I am efficient. I am a loaded gun, a live weapon. I use the tools I've been given, even if that means no tools at all. I am years and years of training, the perfect assassin, a shadow even in the light of the noonday sun. I am an agent of targeted destruction, a demon sent to punish those who've sinned. The fish goes slap against the back of the bartender's head. I steal his uniform, leave him naked in a freezer, and spend the next two minutes cleaning counters. It feels so good to play new Hitman. The last time IO Interactive trotted out the series, back in 2016, I was tentative. Episodic release schedule? And coming off the back of Hitman: Absolution? I didn't expect much, I'll be honest. But IO proved me wrong, me and plenty of others, releasing the best Hitman game since Blood Money and, by some standards, the best Hitman of all time. It easily cracked out list of the 10 best PC games of 2016. 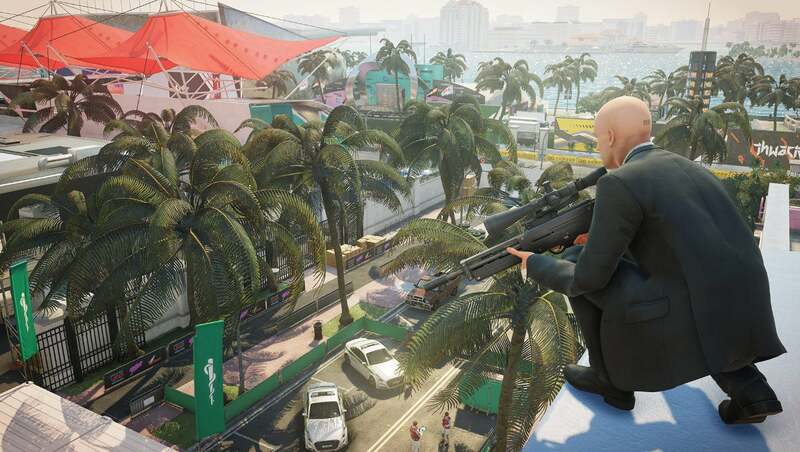 Embracing the open-ended chaos that made Blood Money a beloved favorite, Hitman: Season One sent Agent 47 everywhere from Morocco to Colorado, and gave players the tools to flex their creative muscles. Want to kill a target with a gun? Sure, you can do that. But it also gave creative players hundreds of other options—disguises, improvised weapons like coconuts and crowbars, all the best in assassin technology. Hell, you can dress Agent 47 up as a model and parade him down a fashion runway in the first episode. It's both deadly serious and reliably comical at the same time, and there's something very special about that combination. And I'm happy to report that Hitman 2 ($60 preorder on Humble) is more of the same. We got the chance to go hands-on with the first (I believe) Hitman 2 mission, which also featured in this week's trailer. The location? Miami. The target? A race car driver. We were given the option for a short-and-to-the-point kill, sniping her while she celebrated on the winner's podium. I'm never one to turn down an overly convoluted plan though, and thus decided to take the long route. You can watch a direct capture of the gameplay footage below. Agent 47 started the level looking like the scariest tourist the world's ever seen, bulging muscles barely contained by a white polo shirt. He didn't keep those clothes for long though, as we walked into the parking garage and found a guy in a pink flamingo mascot outfit. And if I'd had my way, that's the outfit we would've worn for the entire assassination. So conspicuous, nobody could possibly suspect me. Unfortunately that plan didn't work so well, and I soon knocked out a security guard, stole his clothes, and dumped him in a locker. That allowed us to get into the VIP area, where we found a pit mechanic drinking quietly. A quick fish to the back of the bartender's head gave us justification to mess with the drinks, some poison sent the mechanic running to the bathroom, and I'm sure you can guess what came next. After stealing the mechanic's clothes, we then headed down to the pit area and started working on our target's crew. For the demo we only had one route available to us: Placing an explosive mine on the back of her car. The pit is ripe with opportunities though, including pouring sugar in the car's fuel tank and loosening the tires. Anyway we detonated the mine, the target died right in front of us in a fiery crash, and hurrah—we succeeded with nobody the wiser. 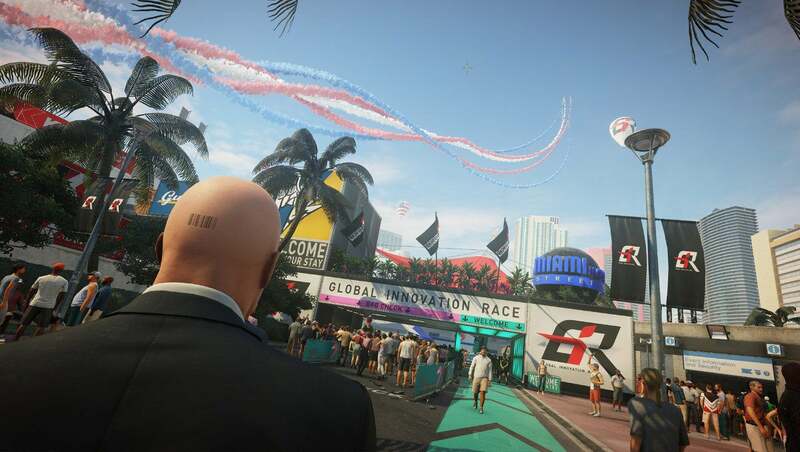 I noted during our PC Gaming Show roundup on Monday that this is Hitman 2 and not Hitman: Season Two, but it might as well be the latter. This feels like an expansion more than a sequel. Miami is a pretty typical Hitman level, and our run through it was a pretty typical Hitman run. But I find it hard to be too upset. I love that Hitman is basically an enormous, living puzzle box. It rewards poking and prodding, analyzing schedules, learning the AI and its patterns. Nothing is more satisfying than putting together a plan and executing on it perfectly, except perhaps putting together a plan and watching it self-destruct. The fact that Hitman 2 ($60 preorder on Humble) is just more of that? Great. It's still such a unique and interesting concept, and when Square and IO split I was worried we'd never see it again. Instead, here I am barely a year after the divorce playing a sequel that feels every bit as grand and ambitious as its predecessor. 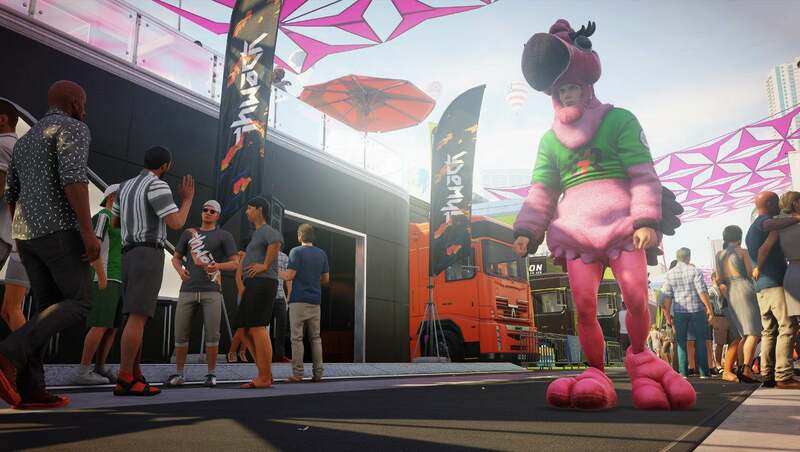 There's that old cliché, "Fans of the genre will enjoy…" But with Hitman 2, that's really the case.